Yup…that means I didn’t go to yoga this morning. Don’t get me wrong, I LOVE yoga, especially at my studio. But my body is exhausted (and still sore) and their Hot Yoga class is REALLY hard! And the Yin style classes are at 8am or 6pm, neither which worked into my schedule today, so I…well, made pumpkin bread instead! We didn’t set an alarm this morning, but Cooper’s internal breakfast alarm can be counted on. At least he waited until after 7am today! The BOY and I took our time getting moving, but Cooper missed the slow Sunday start memo and was bouncing around waiting for food. It may sound like I am talking about a dog here, but he is just a bouncy and continuously hungry kitten. So you may have noticed that I am yet to make anything pumpkin this fall! Or maybe you haven’t noticed, but it’s true, and with the end of October approaching, it is time for that to change. I went straight to my Everything Pumpkin board on Pinterest and started making the first bread recipe that I saw (not surprisingly, there is more than one pumpkin bread recipe on the board). Meanwhile, I made myself a Green Smoothie. In an attempt to assess my current eating habits, I’ve been keeping track of what I’ve been eating this past week. One obvious note…there are not nearly enough veggies in my diet. So I picked up some spinach at Costco yesterday because that is easy to mix with everything. I started with my typical smoothie base of spinach, banana, and almond milk. I added in some Chia seeds and then went looking for something to build in some flavor. I had no frozen fruit, but did find the ginormous bag of cranberries that I also bought at Costco yesterday. I rinsed them off and threw in about a cup. Then 2 handfuls of ice cubes. I went in for a taste test and my smoothie was AWESOME! I couldn’t believe how good it was. In retrospect I should have added some cucumber as well, but I didn’t notice I had any until after I was half way done. As you can tell, veggies just haven’t been on my radar recently. I scrambled up some eggies to go with my smoothie and waited patiently for the bread while the house filled with the smells of the season. I tried to get the BOY talking about this week’s meal plan, but we didn’t get much further than tonight’s dinner. We let the bread cool, only enough to remove it from the pan, before slicing off an end. 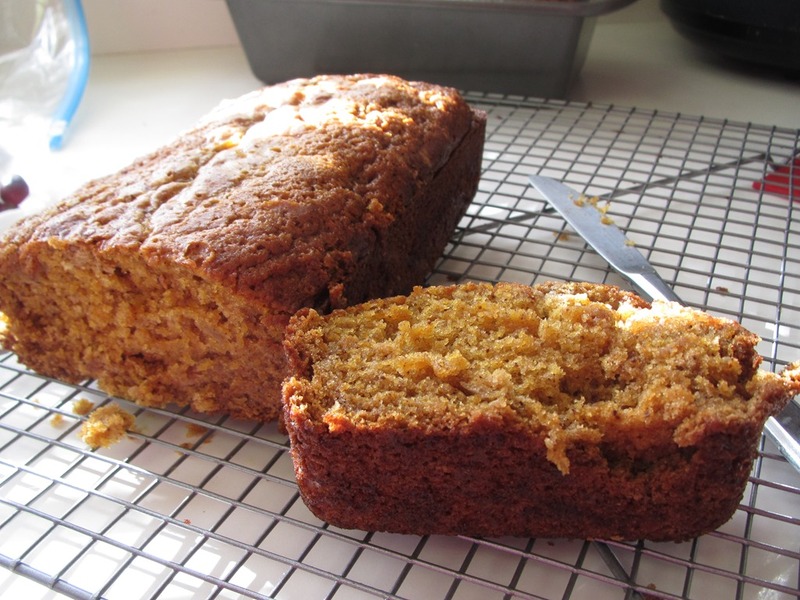 This pumpkin bread is scrumptious! I love how the crust is crunchy and sweet while the inside stays moist and full of flavor! You should definitely add it to your pumpkin board and probably your Sunday as well! All of which pair well with a refreshing green smoothie! Combine milk, spinach, and banana in your blender and chop until spinach is broken down and everything begins to mix together. Add flax or chia and cranberries and mix on high until well combined. Add in ice and blend until desired consistency is reached. Enjoy! Did you make anything pumpkin yet? What ideas should I add to my Pinterest Pumpkin board? I dont think I ever use cranberries except in baking. I going to have to pick some up and try them in a smoothie! I have an awesome pumpkin banana chocolate chip muffins on my vegan sweet board: http://www.pinterest.com/pin/261490322085759666/. They’re a must try! Oh I’m heading over to check that out. I’m slightly addicted to Pinterest and just made some cookies off my cookie board : ) I like cranberries in oatmeal and will be adding them to more smoothies for sure! Yum! I think making pumpkin bread sounds like the perfect way to spend a Sunday! I should’ve made some today instead of spending the afternoon studying (pumpkin bread>studying). Ohhh, well. I’m definitely bookmarking this recipe to try sometime soon! That picture of Cooper makes me laugh. Does he like water? One of my cats LOVES water. It’s weird because I always thought cats hated water! We had a great Sunday Carli! Hope studying went well! Oh no! Is it from your new expensive shoes? I hope marathon training is going well. I just saw a half marathon in January in Arizona. How far are you from Phoenix? I will try to figure out how to send you some pumpkin goodies! ha ha love it and will do! When is the March race? LB and I were thinking to visit you then! About the foot pain, it could also be the width of the new shoe and where you are weightbearing. Bahaha kitty in the sink!! Ohh man, pumpkin bread ALWAYS wins! YUM! It totally does! Maybe that’s why I waited to so long to bust out the pumpkin. This morning, I had to pull kitty out of the dishwasher AGAIN! I’m afraid Cooper and I wouldn’t get along very well in the morning. I guess I should be thankful that I have a lazy dog that likes to sleep in with me!! I have a pumpkin pinterest board, too! I made PB+pumpkin oatmeal bars last week; they turned out great! Also, this smoothie looks delicious! Love the the addition of tart cranberries! I know…I may be adding cranberries to everything. Even that PB and pumpkin bread which sounds amazing. Will you send me the link?